Other than conquests majorly changing the way I prioritise things in game, the thing that has affected my playstyle the most since 2.9 has probably been the way in which housing has changed travel. SWTOR has been criticised for its long-winded travel, and some of that criticism has definitely been deserved: loading screens are long and getting around on any given planet involves a lot of walking or driving. (Complaints about the number of loading screens are definitely exaggerated though - e.g. a quick fade to black and back when you take an elevator is not a loading screen; it just masks your character "teleporting" from one spot to another.) To some extent these issues have been alleviated over time, for example with the travel terminals that allow you to hop between the major daily hubs with the click of a button, but they still exist. Especially while levelling, the constant back and forth between the planet you're questing on, your ship and the fleet can feel tedious sometimes. Strongholds are a fantastic solution to this problem and I would recommend that everyone should invest in at least a basic one even if they have no interest in housing. It's basically your very own "hub" where you can stack pretty much every possible convenience from banks, vendors and mailboxes to GTN terminals and item modification stations, with mission terminals being pretty much the only thing you can't add. The key is that you can travel to your stronghold from anywhere with the simple click of a button and then instantly return back to where you were. Or exit on the planet your stronghold is on. Or your ship. Or the fleet. Basically, it makes convenience easily accessible, while at the same time allowing you to quickly get anywhere you would likely want to be. I'm actually spending more time in strongholds these days (whether it's my own or the guild's) than on the fleet - though the mission terminals and various vendors still provide enough reason to also return to the fleet at least once a day. The guild ship offers the same perks, only that there is no fixed planet to exit onto - you'll pop out wherever the ship has been parked. This can be very handy for conquest and guild events - for example when my guild invaded Nar Shaddaa one week, we parked the ship right above one of the quest hubs where you could pick up the low-level heroics, which made it easy to go straight down there and repeat them every day. 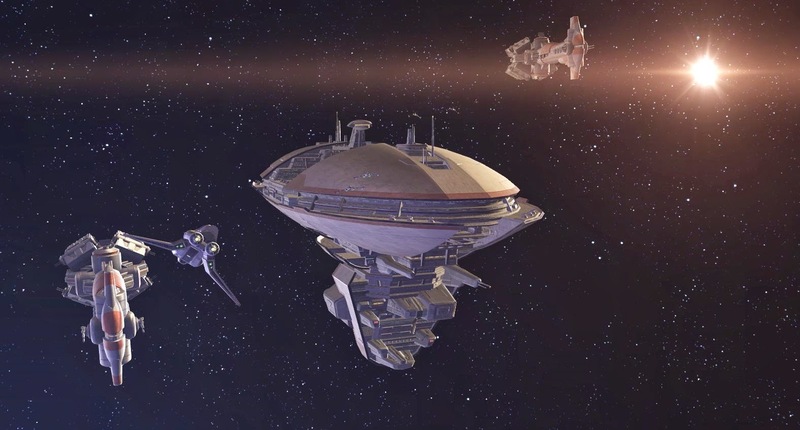 However, guild ships also have another important feature: they've finally brought the "summon" to The Old Republic. Wherever you are (as long as you're not inside a phase or instance), you can right-click on your portrait and instantly summon everyone in your group (whether they are in your guild or not) to your current location, and that for the low price of 20k credits. It does have a cooldown for the individual using it, but if someone missed the summon, you can just have another guild member repeat the process. This has required quite a few mental adjustments. After nearly three years of having to walk/drive everywhere ourselves, it was actually kind of difficult at first to accept the idea of: "Just keep doing what you're doing; we'll summon." Initially people still started to travel everywhere on their own even when they had been told that a summon was incoming, simply because it was too much of a habit. It didn't take long to shake this off however. Being lazy comes naturally to most of us. Quick planet hopping while hunting for enemy commanders has proven the worth of the feature to everyone in the guild by now. "Imperial commander up on Tatooine!" someone shouts. Form group, press button - boom, everyone's right there in the Imperial base. It also makes competition between guilds and world PvP more interesting and unpredictable as a result, as a seemingly lonely player could suddenly summon in a full raid group from one minute to the next. Datacrons offer up another new and slightly cheeky function for the guild ship transport: get someone to the datacron, group up, get summoned and save yourself the aggravating jumping puzzles. Some guildies already had fun selling this as a "service" to people who wanted the fleet datacron. Even if we charged them some money (after all the summon costs 20k credits each time) they were universally happy with how much easier this was than actually going through the whole procedure with four people and an MGGS. Sadly Bioware has since made this impossible, so I'm guessing they thought that this was taking it a step too far. Another guildie parked an alt on the endurance datacron on Makeb and went on a summoning spree for everyone in the guild who wanted it, no matter how many alts they wanted to bring. Personally I was even more grateful for that one than for the fleet datacron (while it still worked). The galaxy is a smaller place now - but in a good way.